Office fitness is a new concept of physical fitness that recognizes the sedentary, repetitive nature of modern computerized desk work. Sitting at a desk all day, operating a computer for long stretches of time, is a relatively new behavior. Over the past 30 years, tens of millions of us have been used as lab rats in an unplanned experiment that is testing how we respond to long stretches of sitting, in spine-crushing chairs, in high-stress jobs, doing repetitive actions, on poorly designed machines. The results so far don’t look too good. Back pain, carpal tunnel syndrome, repetitive strain injuries, obesity, and other consequences of office work are at epidemic levels. Naturally, I offer massage for office workers, but I also offer personal training sessions tailored for office workers, and have curated a collection of office fitness exercises that you can do on your own. I write regularly in my office fitness blog, and I have even written a whole book on office fitness and keep a list the office-fitness research sources that I have consulted as I wrote the book and the content on this website. If your professional association or other organization would like to book me for a speaking engagement, I also offer engaging and informative Office Fitness Talks. New challenges like sitting disease and repetitive-strain injuries require new solutions. Conventional fitness is based largely on an athletic view of your body. It’s about building strength, becoming more aerobically fit, staying flexible, and getting as lean as possible. These are, of course, laudable goals, and we should all be working toward them. But we’re not all athletes. More to the point, the biggest problems we face in the office don’t require an athletic solution. To fight sitting disease, we just need to move more. Likewise, to prevent repetitive-strain injuries (RSI’s), we need to be more robust, but not necessarily NFL-linebacker robust. We can benefit from better posture, but we don’t all have to carry ourselves like Olympic gymnasts. We need to understand ergonomics, but we don’t need to become professional ergonomists. You may have noticed that exercise came in last in that list. That’s intentional. Alas, sitting disease doesn’t work that way. The research (reams and reams of it now) consistently shows that you can’t simply exercise your way out of sitting disease. You face the risks of your sedentary workstyle regardless of how much you exercise. You could run a 10K every night after work and a marathon every weekend and still be at risk if you sat at a desk eight hours a day during the week. Even if you’re among the small percentage of people who are actually meeting government and fitness-industry workout recommendations, even if you are as fit as a fiddle, even if you look like a Greek god or goddess, you are still at the same risk for disease as your less-fit colleagues. In the language of science, sedentary office behavior is an “independent risk factor,” one you face every time you sit down at your desk, regardless of your outside-the-office fitness level. Since the harm that sitting inflicts on you accrues regardless of what you’re doing the rest of the time, it behooves you to figure out how to sit less and to move more during the day. Assuming that you’re stuck with your commute, that you’ll still sit down to take meals, and that you’ll still relax on the couch with some TV or computer time after work, that leaves your workday as your best opportunity to become more routinely active. It’s unlikely that a majority of us will start working at standing desks or treadmill workstations right away, but you can still take steps right away to improve your office fitness. I literally wrote the book on office fitness (well, at least the first one). 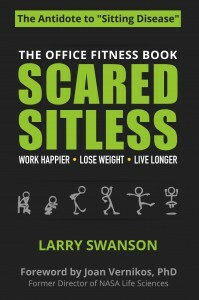 Scared Sitless: The Office Fitness Book first set out these principles in detail. It’s probably not the be-all and end-all of office fitness resources, but it has already helped a lot of folks become healthier and happier at work.